Students need lots of distributed practice to master basic facts. Games are a great way to incorporate this practice as students are highly motivated to play and because many games are easily differentiated to match the varied needs of learners in a class. Plan to include regular game time sessions in your math schedule. Many schools already utilize a weekly Game Day where students play games while teachers meet with small groups of students to reteach important concepts/skills or to provide enrichment opportunities to challenge talented students. When well-planned, these Game Days are a win-win for teacher and students! Begin or end regular classes with an appropriate Who Has? 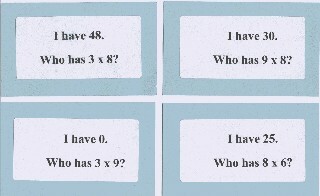 deck to practice basic facts. Time the class as they progress through the deck. Challenge students to improve their time each day. See Who Has? Activities for instructions on using this resource and to download Who Has? decks to address different math concepts and operations. Schedule 3-4 different games for this day. Create small groups and have them cycle through the games during the class period. Be sure to have all game boards and materials easily available for students to "grab and go." A work board, pictured to the left, that shows groups and the order in which groups will play the games is an effective classroom strategy for these game days as it builds student independence and responsibility. Students should already be familiar with all of the planned games. If a new game is introduced, make this a teacher station where you can introduce and monitor student understanding of the game rules. Follow this with an independent play station for the game. Check out the Mathwire Math Games Collection for additional games to add to your Boot Camp collection. Spark extra motivation by establishing class play-offs or grade level tournaments of math games. Contig, pictured at right, would make a great partner play-off game. The partner version encourages students to discuss and agree on the best option, increasing the likelihood that students actively consider many options before choosing their play. 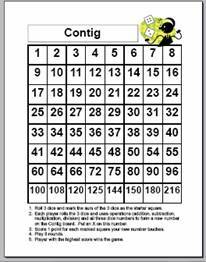 Students toss three dice, then use those three numbers and any operations to form a number on the game mat. Students score a point for their number plus extra points for each covered square their number touches. 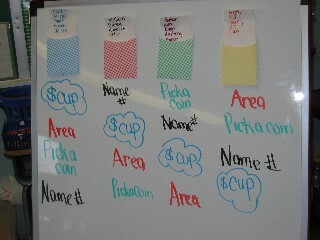 Students are motivated to consider many options in search of the most points for each play. You might need to use a timer to limit thinking time and reward students who have fact power, thereby encouraging all students to work on fact mastery. Class play-offs naturally extend to grade level tournaments and are a great end-of-the year math activity for math-letes. Factor Blaster, pictured at left, provides excellent multiplication facts practice as students must know all facts for a number to successfully choose their best points option for play. The first student selects any number from the board and gets that many points. The opponent gets to remove all factors of the selected number that are still on the board and gets points equal to the sum of these factors, so students learn to choose wisely to limit their opponent's point gain. An added benefit of Factor Blaster, as opposed to Factor Game, is that students learn and capitalize on the prime numbers as these yield the most points and limit their opponent's scoring of factors. 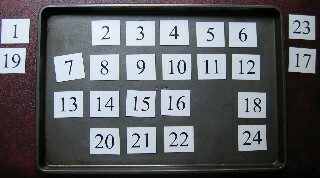 Use the suggested cookie sheet option for an easily stored classroom game. NCTM's Factor Game and Product Game provide great multiplication facts practice as well. Students may play the online versions to learn and practice the game. Create classroom mat boards for these games and store them in the classroom game center for easy use. The Everyday Mathematics game, Name That Number provides mixed facts practice that is easily differentiated from addition/subtraction to multiplication/division to all operations. Students may practice the online version of Name That Number to practice addition/subtraction facts in preparation for the class play-offs. Establish a math games section in the classroom so that students can easily locate materials for play. Some teachers establish take-home packs that students bring home to play with parents. Other teachers make games available during before/after school care or tutoring sessions to provide additional practice for students. Read more about helping students develop Basic Facts Fluency. Find Basic Facts Links to help students practice basic facts online. The second installment of this series is now online. Math Manipulatives: Investigating Dominoes is a one-stop resource for dominoes that includes games, math-literature connections, problem solving, templates and links to additional online resources to help students use dominoes to develop number sense. Be sure to check out the Domino Fun section at the bottom of this page to view some amazing Domino Art and to master a domino trick that will astound your students! View the Investigating Dominoes collection. View the Investigating Tangrams collection.